Cut -copy the selected text to the clipboard and remove it from page. 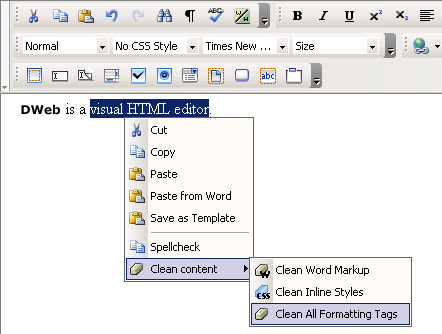 This menu entry performs the same action as the Cut command in the toolbar. Copy - copy the selected text to the clipboard and leave it in page as well. This menu entry performs the same action as the Copy command in the toolbar. Paste - replace the selected text with the content from the clipboard (or simply place that content where the cursor lays, if there is no selection). If no content is in the clipboard, the option is disabled. This menu entry performs the same action as the Paste command in the toolbar. You can see the Paste from Word command as a mixture between the Paste command and the Clean Word Markup command. This way you will easily upload and then insert the needed images in page. Save as Template - save the selection as a separate template file. Read more about this here. Spellcheck - start the spellchecking process of the current text selection. Read more about the window that pops-up here. Clean content - this entry is a sub-menu that expands while hovering the mouse cursor over. Read about its role and the three options here. 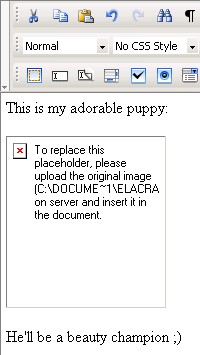 Note: On Mozilla the Cut, Copy, Paste, and Paste from Word menu entries are disabled due to a security feature. As you noticed, the right-click contextual menu groups together options often needed. Use it whenever you want to save time with accessing certain commands.